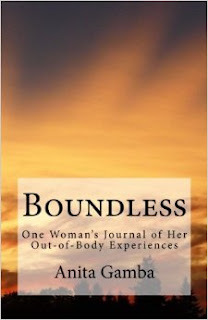 Today I'm reviewing the book Boundless: One Woman's Journal of Her Out-of-Body Experiences by Anita Gamba. This book is simple. It is almost entirely OBE narrations. There's also some theory and basics, plus a few notes about her primary OBE technique (which is more about relaxation and setting intentions than anything), but mostly it's just narrations. That's okay because I've always loved OBE narrations; they always take me back to that magical thrill of discovery. It also helps program your subconscious mind to induce OBEs. Gamba's OBEs started when she gave birth to her son. Since then she's recorded "over one hundred and fifty out-of-body experiences." At first, she tried to figure them out in terms of quantum physics (as did William Buhlman in Adventures Beyond the Body), which led her to more research than the average person. She became quite knowledgeable in the stuff, which is not an easy task. In the end, she gives a curious mixture of science and philosophy. She is honest, genuine and up-front about her OBEs. She openly admits her shortcomings and when she doesn't understand something. Her OBEs are pretty basic and typical. She experiments with floating and flying. She finds out she can breathe underwater. She looks in the mirror. She encounters other people and animals. On the one hand, they're not quite thrilling to someone who's been studying and practicing OBEs for 35 years. They're certainly not tedious though. On the other hand, there's nothing startling, controversial or surprising in there either, so I know she's not making this stuff up: she's really been there. When I am patient and stay focused I am successful at anything I choose. I know how to hold my focus whilst the world is trying to pull me back to its reality. I need to trust my own judgment and I can always call on my inner power to protect me. I have always had the courage to move through doors of change, not knowing what is on the other side. I have always had the presence of mind to make firm decisions about moving on if the present situation proves to be too macabre for me. The voice that told me not to go to the past reminds me that the voice of my inner wisdom should be listened to even if it sounds harsh. The book is pretty basic. You're not going to find any startling revelations or the depth of, say Jurgen Ziewe or Frederick Aardema. Perhaps I'm a bit jaded because I recently read and reviewed Ziewe's latest book, Vistas of Infinity, and that's a tough act to follow. This book is 119 pages long. The size is normal, the typeset and margins are good. It's quick and comfortable (not heavy) to read, but there's enough content that I didn't feel short-changed. I don't recall any grammar or spelling errors, so the book is well executed. There was nothing offensive, nor anything I disagreed with. I'll give it a thumbs up, but there are better narration books.